“On Monday, November 27, the United States Supreme Court let stand a California federal appellate court decision that could chart a new course for Native American tribal groundwater rights,” reports Debra Utacia Krol in News Deeply. The case was Agua Caliente Band v. Coachella Valley Water District. 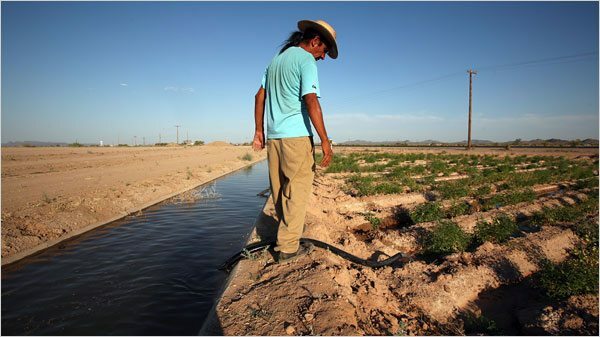 Last March, Krol reports, a three-judge panel of the U.S. Court of Appeals for the Ninth Circuit ruled that the Cahuilla’s water rights include an aquifer that lies beneath the Palm Springs-based tribe’s 31,500-acre reservation. “The United States impliedly reserved appurtenant water sources, including groundwater, when it created the Tribe’s reservation in California’s arid Coachella Valley,” the judges ruled. The court’s decision is based on the Winters Doctrine, which, Krol explains, “springs from a 1908 Supreme Court decision that reserves the federal government’s right to reserve sufficient water for Indian reservations’ needs.” The decision in the Agua Caliente case effectively affirms that tribes have a federally reserved right to groundwater, at least within Ninth Circuit states. In addition to California, the Ninth Circuit includes Alaska, Arizona, Hawaii, Idaho, Montana, Nevada, Oregon and Washington. While Agua Caliente’s court victory has established its aquifer water rights, The Ninth Circuit Court still needs to hold a second trial to determine how much of the aquifer belongs to Agua Caliente. The second trial will involve so-called “Phase 2 Legal Issues—the correct standard or methodology for quantifying the tribe’s share, whether the federal reserved or Winters water right carries with it a right to water of a certain quality and whether the tribe owns the groundwater storage space, or pore space, under its reservation,” says Kate Anderson, director of public relations for Agua Caliente. A quick search into the NPQ annals reveals dozens of illuminating articles on the pros and cons of corporate-nonprofit relationships. Sponsorships of this sort are nothing new, but some partnerships raise more eyebrows than others.